SCOTTSDALE, Ariz. – January 4, 2017 – Barrett-Jackson is revving up the superstar power with an unbelievable lineup of the world’s most coveted modern supercars that will cross the block during the 47th Annual Scottsdale Auction, January 13-21, 2018, at WestWorld of Scottsdale. Supercars by Porsche, Ferrari, Aston Martin and Lamborghini will be among the most sought-after vehicles during Collector Car Auction Week, including a stunning 2015 Porsche 918 Spyder (Lot #1415), one of the most advanced high-performance hybrids on the market today. 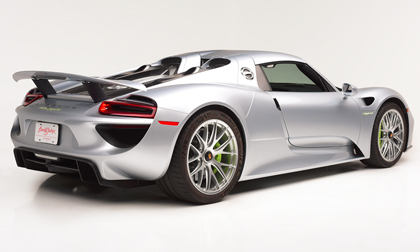 Arguably the most advanced high-performance hybrid on the market, a 2015 Porsche 918 Spyder (Lot #1415) is powered by a 4.6-liter V8 mid-engine hybrid and 7-speed PDK transmission. Its combination of 285hp of electric motors and 608 gasoline-generated horsepower produce a combined 994 ft/lbs of torque. One of several Lamborghinis on the docket, a 2014 Aventador LP700-4 (Lot #1374) produces 700hp from its 6.5-liter V12 engine and includes a 7-speed automatic transmission with all-wheel drive. The unmistakable style of Ferraris will also be on display in Scottsdale, including a 2015 Ferrari 458 Italia Speciale (Lot #1431) from the Steve Todhunter Collection with a 4.5-liter 597hp V8 engine and reprogrammed 7-speed dual clutch automatic transmission for quicker shifts. Among the more classic highly anticipated exotics set to cross the block is a 1966 Aston Martin DB5 (Lot #1389) featuring its original rebuilt matching-numbers 4-liter 282hp engine mated to a ZF 5-speed manual transmission. A 1952 Ferrari 212 Europa (Lot #1378) is the third of just 11 212 coupes built by Pininfarina. The masterfully hand-built beauty is a multiple award winner, including Best in Class with a perfect 100-point score at Pebble Beach Concours. 2007 Ferrari 612 Scaglietti F1 (Lot #1313) – A one-owner car with only 4,777 actual miles.